Our recent expedition to Myanmar was a combination of all the things I love about diving. 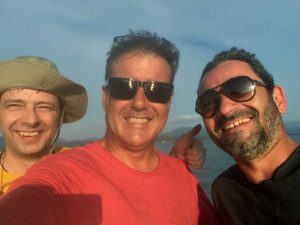 Discovery, adventure, diving with manta rays, diving with great buddies and having a lot of fun on a Myanmar liveaboard in a far flung location. So far flung in fact that we actually fell off the sea chart for Myanmar’s Mergui Archipelago. It was the realisation of a plan I had been hatching for a while now. It reminded me of my early days of diving in Myanmar and would result in something rather exciting for the future. The fact that Morgan and Michael had returned for another adventure made it all the more special. They were present the first time I led a longer expedition into Myanmar almost 10 years ago and their participation once again was reassurance that we run trips worth coming back for. They were joined by many more familiar faces who have dived with us in more recent years. It was great, instant camaraderie and fun right from the off. 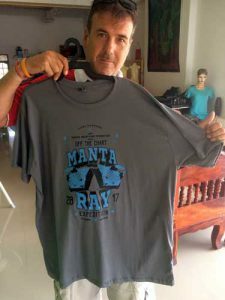 So the first ever Manta Discovery Expedition started at a familiar small resort, Phu Khao Lak early on 14th March 2017. 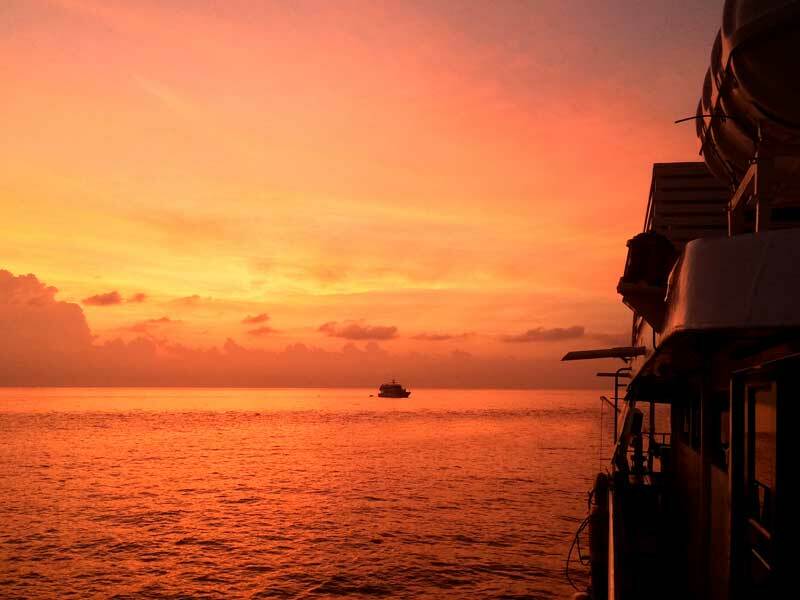 Like most of our previous expeditions to Myanmar, Phu Khao Lak is our mission control, our Houston on the Andaman Sea coast. A few of us had already done the pool meet up session the day before, like we do every year to catch up on life since we last met, reminisce over previous trips and chat about the latest expedition plan. When I say plan I now smile to myself. We had more an idea for an expedition than an actual plan. That’s one of the advantages of calling a Myanmar liveaboard trip an expedition, the term expedition gives you plenty of scope to make things up as you go along. But there was an idea, a rough, if not sometimes vague plan behind the expedition. To visit manta hotspots in Myanmar and Thailand with Anna to conduct ongoing research and education as part of our long term commitment with the MMF. To scope out new manta dive sites further north in the Mergui Archipelago based on satellite tagging data. To have plenty of fun and good times between dives on our boat, the Deep “Fried” Andaman Queen. Back to our Houston where our mini buses and staff had assembled to begin hotel pick-ups. I was excited that departure day had come around after months of planning and fretting about the trip. I approached the day in my usual cool manner (even if I say so myself) but inside I was fretting more than ever…. had I over looked anything, forgotten anything, forgotten to tell the group anything, would Myanmar entry go smoothly, would we see mantas, would northern Mergui actually be any good, had we packed enough Hong Thong, had we packed too much Hong Thong, had we forgotten to pick someone up, was I fretting too much, was I mentally torturing myself…… probably. 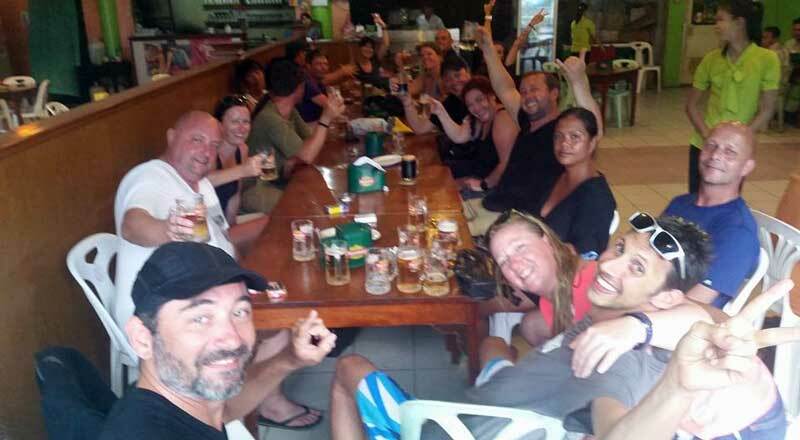 We had a great team; Anna, Rachel, Niko, Christian and Neil, we had a great boat with a great tour leader, Steve and his great dive staff, Leanne and Chiko, plus one of the best Thai crews around, Kao and the rest on the Deep Fried. Still, I can never really relax until we’re cleared by the harbour master and we’re heading out into the Archipelago, Victoria Point behind us and with the sun setting behind St. Matthews Island to the west as we head north. After the long haul north to Ranong, successful conclusions with Thai and Myanmar Immigration, briefings, check-ins and equipment set ups we were all finally enjoying a beer watching the sun set over St. Matthews Island heading north into the Mergui Archipelago. Damn I was excited. We were all excited (with possibly the exception of the captain) as we headed north. This wasn’t going to be the usual north, this was to be serious north. Steve had okay’d a route that would take us Off the Chart. Properly off the chart, further north than any documented trip to date, off the edge of our known Andaman world. Off we set, an awesome bunch of people and a rough outline, all accompanied by a rumble of engines as we motored north into the night. Expeditions were high waking up at Black Rock. We’d arrived shortly before dawn, the captain dropping anchor where we had a good view of the western profile of the rock. The sky turned from black to orange to blue as the sun rose, the rock turned from dark black, to dark black tinged with orange to a slightly lighter black. I’d left Black Rock just seven days ago on a Ray of Hope Expedition with Dr. Andrea Marshall. We had spent three days at Black Rock and witnessed a record breaking number of manta encounters. 52 to be precise, fifty two different mantas, all ID’d and mostly magnificent encounters. So with this in mind expectations were high. Sadly on this day encounters were low. We didn’t encounter a single manta ray over the four dives. We did however have very nice visibility and strong currents which yielded decent productivity in the water. Plenty of fish life including a cool white frogfish and two African pompano, a fish I’d only seen for my first time in well over 3,000 dives on my previous visit here. Normally this would have been a great day at Black Rock, but without mantas on a manta expedition it wasn’t quite what we were expecting. Not to worry, we would visit Black Rock again on this trip, and like Gollum in Lord of the Rings, mantas would still have their part to play in this story. For now, sunset and some drinks and some more motoring north. To Great Western Torres where i had something special planned for the early morning. As well as our vague plan I also had an ulterior motive behind the discovery part of our expedition. More will be revealed as we go along. For now it’s enough to mention that heading north I wanted to draw on what limited knowledge I had of these more remote areas. I’d first visited Great Western Torres in 2009 tour leading MV Similan Jazz. I remember clearly heading between the two main islands, through a narrow channel. Wide enough for the boat to run through, narrow enough with a strong current to keep the captain on his toes. With dense jungle close on either side and a distinct lack of human presence it had the feeling we were entering a forgotten world. So in 2017 this was to be our gateway to the more mysterious northern extent of the Mergui Archipelago. At sunrise we weighed anchor and headed towards the channel. Orange skies to the east and the dawn gloom hanging over Great Western Torres to the north. A few brahminy kites swooped low over the water searching for their breakfast. 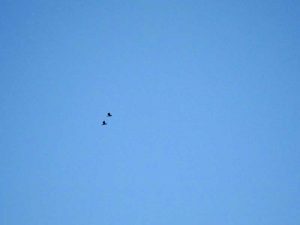 As the captain negotiated the strong flow of water through the channel two great hornbills flew high over head. I was buzzing, the presence of my favourite bird made our entrance to this lost world all the more impressive, Jurassic Park style impressive. Dive one was around four granite rocks that broke the surface to the north east of GWT. I’d dived here a handful of times before so I had and idea what to expect. Large granite boulders, covered with large tubastrea corals (cup corals) interspersed with large sandy patches surrounding shallow hard coral gardens and plateaus. 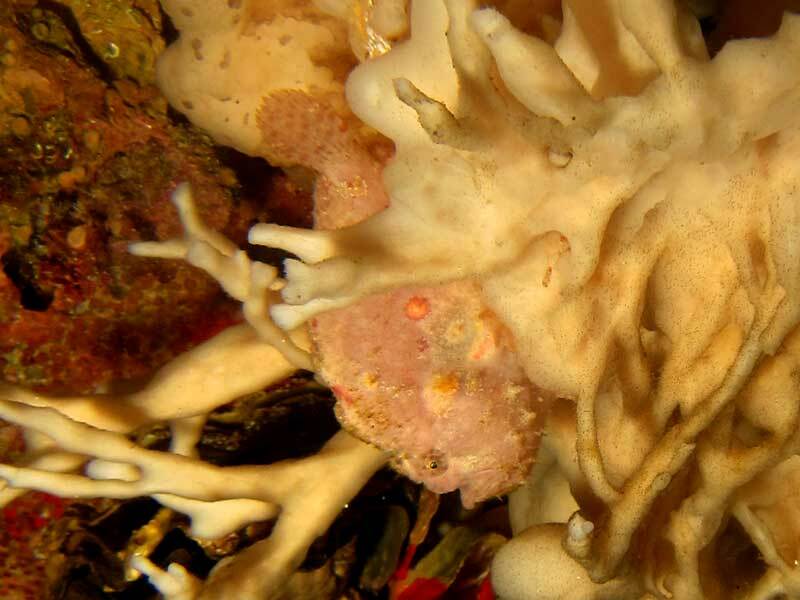 During the dive I was searching for two large boulders with a narrow channel between. 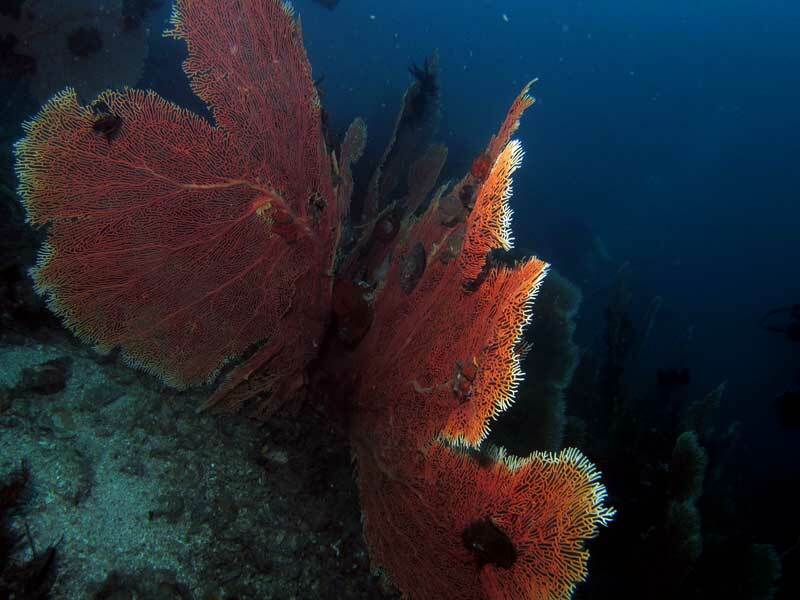 Strong currents must push a lot of nutrients through this channel as the granite walls are dense with sea fans. Glass fish school around the fans, feeding on plankton flowing by, lion fish, grouper and snapper hang out in the currents feeding on the glass fish feeding on the plankton. This is one of my favourite mini ecosystems in the Andaman Sea and I was happy to hang out there a while mesmerised by the action. Dive one was a decent start to the day, the visibility was okay and there was plenty of fish life around the site. Rich named the site Frederick Rock, after his ‘coming soon’ baby boy. During breakfast we headed north to Prinsep Island where we would find one of the Archipelago’s most foreboding looking rocks. Dolphins accompanied us for a short while. Tower Rock rises steeply up from the Andaman Sea at the north of Prinsep Island. It would make a perfect base for SPECTRE and Blofeld to conduct sinister activities against James Bond should they ever need a base in Myanmar. It’s an evil looking rock. I have dived a couple of times around the base of Tower Rock and on both occasions been disappointed. Like it’s foreboding appearance seemingly acting like a warning for life to keep its distance. Whilst scoping out a rocky outcrop to the west of Tower Rock a small mobula ray breached, spinning like a cartwheel. This seemed like a good spot to try for dive two. On the dive we were rewarded with a giant red frogfish and two huge cobia. I has a brief encounter with a mobula on our safety stop. Dive three was a lively affair. We jumped at the large rocky pinnacle to the west of Prinsep. An impressive looking site topside. One large rock with two more rocks rising high on top. There was a colourful plateau at around 16m depth where we jumped on the northern side. We hung in the current watching the colourful, abundant fish life. I briefly saw two black tips, they darted out from the depths, turned and vanished as fast as they’d appeared. Heading round the west side close to the bottom presented more of a wall dive before shallowing up on the south end of the site amongst huge granite boulders. The visibility was best to the north, not as good on west and south sides. After the dive we steamed north to Metcalfe Island. From this point only one person on-board had been further north in the Mergui Archipelago and it wasn’t me. From this point on we’d be relying on Morgan’s memory. Dive four was a sunset dive on a sloping rocky reef on the south side of Metcalfe Island. 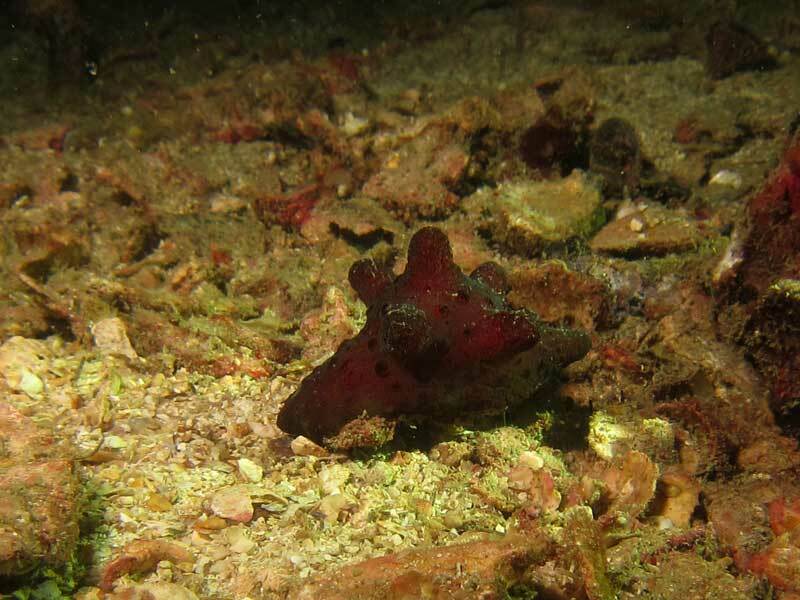 After 20 minutes of nothing but barnacles and sea urchins on barren granite boulder in very poor visibility I spotted a sponge snail. I knew this was about as good as it was going to get and signalled to my group, thumb up or thumb down. My team had showered and were enjoying sun downers at the front of the boat as the first of the other groups surface marker buoys appeared. During dinner the Deep Andaman Queen resumed it now familiar role, bow facing north, engines keeping us at our 9 knot cruising speed. Next stop, Chevalier Rock. Enjoying drinks after dinner we noted a considerable increase in fishing boats. We hadn’t seen many signs of life after Black Rock. The increase in activity here was likely from the town of Mergui, a sure sign we were making good progress north. In Burmese word for Mergui is Myeik. 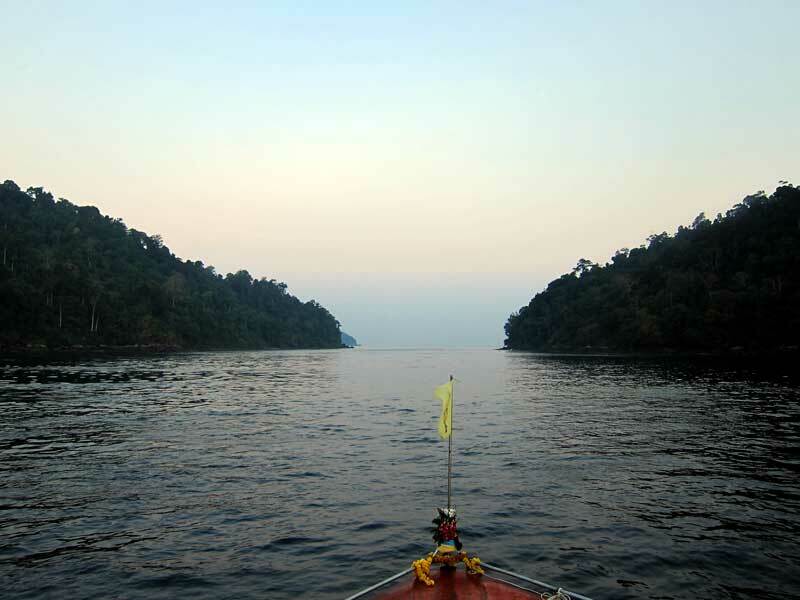 So the Mergui Archipelago becomes the Myeik Archipelago. Thanda, our most favourite Myanmar citizen ever taught me how to pronounce the word correctly, Firstly resist the urge to pronounce the My and the ei as long sounds, shorten them. Secondly try to say M, Y and K as just one letter. The resulting sound is about as good as you’re going to say it. There were a couple of possibilities for dive one at Chevalier Rock. 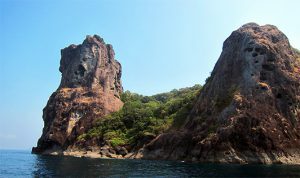 Either a small rocky pinnacle close to Chevalier or a larger rocky island called Lion Rock. I asked Morgan what he remembered from diving here. He shrugged his shoulders and smiled. I opted for the small rocky pinnacle. This was a typical Myanmar dive site, some barren spots, some lively coral gardens and large sea fans. There was an interesting wall on west side of the rock, the east more sloping with rocky plateaus. Some groups saw large cobia again. Although the visibility wasn’t great most enjoyed dive one on day three. During breakfast we cruised north west to West Canister. This was one of our main goals. A site we had heard good things from Morgan, more than just a shrug and a smile at any rate. It was also a site very close to the top of our chart. West Canister looks very much like Koh Bon in neighbouring Thailand, a little smaller and instead of Koh Bon’s distinctive west ridge, West Canister has two ridges protruding out from a small bay on the island’s west side. Jump group one would explore one ridge, group two the other. My team had the more southerly ridge. The current was strong and pushing us out of the bay. I opted to turn around and dive the sloping rocky reef along the south side of the island. Liane and Neil’s group pushed on and encountered two eagle rays. The visibility at West Canister was good and there was plenty of fish life. Ending the dive Neil’s group spotted around 15 mobula rays. Things were falling into place nicely. For dive three we swapped ridges. We stayed on the northerly ridge for most of the dive exploring the abandoned fish cage around 20m and the pinnacle out from the bay. This ridge was much more colourful with more soft corals making it even more reminiscent of Koh Bon. We ended the dive swimming across the bay which was barren with a fair amount of surge. Dive four wasn’t up to much after the great dives at West Canister. Heading east there were two small rocky pinnacles, thoughtfully named S. Pinnacle and N. Pinnacle. Underwater they were connected by a large rocky plateau at around 20m. There were plenty of fish around, the visibility slightly reduced. It just felt like a lot of swimming for little reward. After a short cruise north we anchored off the south of Kabuzya Kyun (Island) for the night. During the cruise I made my first ever manta presentation. I’d done this on quite a few trips before but never on one of our manta expeditions. Usually Dr Frabrice Jaine was on board to take care of this but on this trip I’d have to fill his shoes, not literally, not even i have feet as mighty as Fabrice. The plan was I would cover basic manta info and Anna would continue the following night with more detailed info and analysis of our Manta Matcher database. Keeping the presentation short and sweet it went down well with group. Hitting the front of the boat, evening drinks went down even better. All in all it had been a great day diving new sites. West Canister definitely looked like the type of place that mantas would visit. It’s remote location, topography and surrounding deep water were very promising. We would just have to work out the best times to come back here. 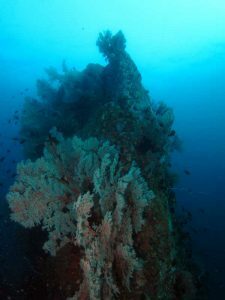 We began the day with dive one along the western side of Kabuzya Kyun, a granite boulder island much like Similan Island 8 in Thailand only shorter and wider. We dived around a large, mostly submerged rock surrounded by other large, deeper boulders. A few pickhandle barracuda cruised about in small schools. The other marine life was typical of large boulder sites, blue ringed angelfish, box fish and moray eels. This site was to be the most northerly of all our dives. After the dive we cruised north following the west side of Kabuzya Kyun. Leaving the island behind us we pushed further north crossing 12degrees 50 minutes, the latitude that marked the top of our chart. We done it, we were officially off the Chart. The moment was a little surreal. The sea was glass calm, the sky so hazy that the horizon was blurred. Where the sea ended and the sky began was hard to distinguish. It felt like we might fall off the edge of the earth as well as the chart. Apart from Kabuzya Kyun behind us and a solitary small fishing boat to the north there was nothing else to see. No more islands or land, nothing. If I was plotting sea charts I would have ended my chart here too. We stopped the boat for a group photo with our chart, our current location clearly marked. Whilst we were nowhere it seemed fitting to go for a swim. We jumped in the sea with our inflatable toys, Manta frog and crocodile. It was an amazing moment on what was already proving to be an amazing trip, we were off the chart and Off the Chart Expeditions changed from a vague plan into something more tangible. We would be doing this again, life was good off the chart. Heading back on the chart we continued our circumnavigation of Kabuzya Kyun. The island is very pretty along its eastern side. Much like the Similans, turquoise waters marking shallow areas, perfect white sandy beaches, prehistoric granite and deep green jungle. The odd Longtail boat or two moored in some off the bays. A slow reintroduction to civilisation after our adventures off the chart. We were on our way to the curiously named Freak Island. Our current island was drawing us to stay a while but we pushed on only to spot two minke whales further out in deeper water. We stayed a while longer after all, sometimes the two whales were a mere 30m from our boat. Dive two at Freak Island was another typical Myanmar dive. The visibility was okay, there were some lively portions of the dive site, a few fishing nets, a few stumps of dead sea fans, a few colossal sea fans, but generally plenty of fish life and healthy corals. Another enjoyable dive. 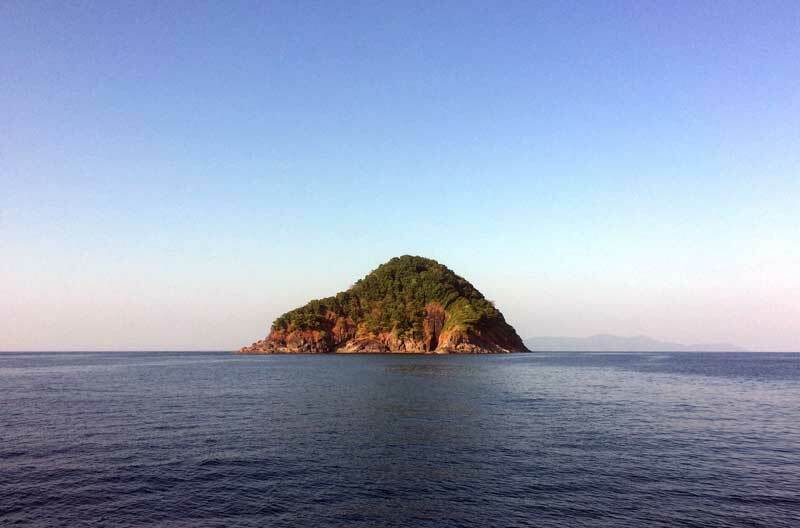 For our final two dives at the most northerly charted area of the Mergui Archipelago we headed back to West Canister. This has been the best dive site so far and there was also nowhere else to go. Anna Pipi took charge of the dive plan for dive three, at least for my group. Dive the southern ridge but leave at least 15 minutes for our safety stop and swim out in the blue. Why? Here’s why. Ending dive three a little earlier we found ourselves drifting away from the island on our safety stop. After a while Anna was squealing like an excited child pointing some metres below us. A large mobula was gliding by underneath us making a large circle before disappearing out of sight. Good plan Anna. I skipped dive four. I went for a nap. Tara and Morgan didn’t, they went for a dive and encountered 30 to 40 schooling mobula rays. Thank you West Canister, you’d blown us away. And so the long haul south commenced. The captain had a long night ahead. At least another 11 hours to cover the 80 odd nautical miles to Black Rock. Was the trip drawing to a close? No way, it felt like we were just getting started. This is where we started to get serious about fun. First off we had a presentation from Anna Flam. Another great presentation from ‘Flanna’ and a positive reminder why we do these trips. We were heading back to Black Rock and time to regain our manta focus. But first dinner and then Anna Pipi’s karaoke microphone. Our sociable evenings sat at the front of the ‘Deep Fried’, in an area we’d nicknamed Klub Kao (actually where deck hand Kao slept when there weren’t drunken microphone wielding wanna be pop stars around) became even more fun. We were a happy crowd, sharing sociable drinks and the like with laughter and now karaoke. Could this trip get any better? Yeah, Michael had some aces up his sleeve still to play. Further from full moon we had higher hopes for manta encounters at Black Rock. Dive one was tense. The water visibility was less than it had been a few days previously. This looked more promising. We circled the rock always looking out into the blue, hoping to catch a glimpse of an approaching ray. We paid no attention to the soft corals, now teeming with fish life. Shallowing up towards the end of the dive it seemed like it would be another mantaless dive. I was feeling despondent but not without hope. Day one of our manta extravaganza with Andrea had started the same way with nothing on dive one. Ending the dive at the southern point, a large manta trailing some rope or net appeared from the gloom. It was deep, close to the bottom at around 30m approaching from the south, heading north along the rock’s eastern side. I really wanted to swim down to check it out but a 30m bounce seemed a little reckless, at least on this occasion. Then a smaller manta appeared around the same area. It came a bit closer but then turned and swam off. The manta’s behaviour was typical of early morning dives but at least we’d had some encounters, at last. Would it be game on again at Black Rock? No, not on the second dive. I was expecting, well hoping for plenty of manta action but sadly saw none at all. 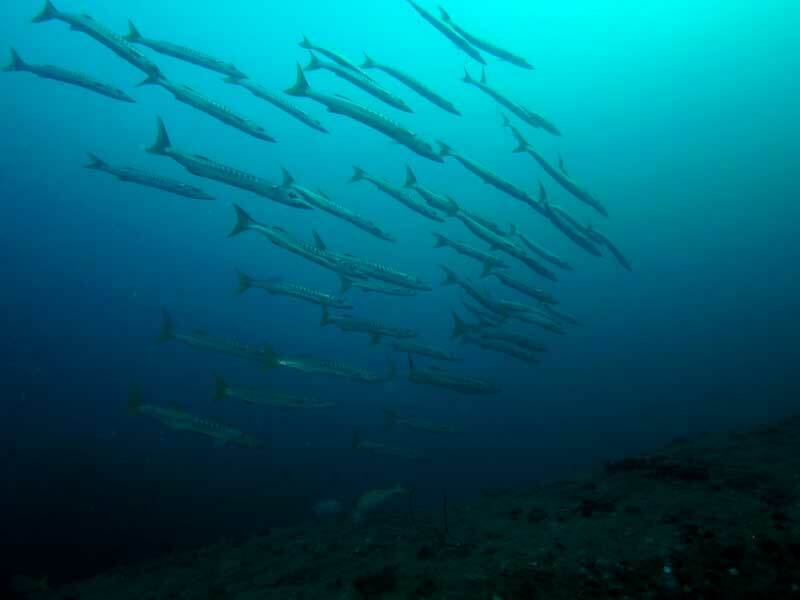 There was plenty of fish life though and despite the lack of mantas it was still exceptional diving at the rock. Rachel’s team did see two manta at the end of their dive, there was still hope. For dive three we spaced the jumps teams a little further apart to lessen the diver impact on the site. It seemed like we were dealing with shy mantas on this day. Towards the end of the dive a large female showed up and I finally managed to photograph an ID. Liane’s team also saw a manta. I was really happy for Peter and Red Terry who had never seen a manta before. They were super thrilled and though it was a poor manta day for Anna and I, I always get a thrill seeing the effect these charismatic creatures have on divers. Shallowing up at end of dive 3 we drifted through a massive school of big eye trevally. It was amazing. I was hard pressed to recall a dive where I’d seen as many fish as this. The plan for dive four was simply to stick to the sloping, east side of the rock and just enjoy the abundant fish life we’d seen so far but with hopefully some sunset action. The dive was great and went according to plan with big schools of jacks, smaller packs of rainbow runners and tuna and of course the massive uber school of big eye trevally. Black Rock hadn’t delivered the mantas it had hinted at from the earlier dive but it was still Myanmar diving at its best. The same night was singing at its best. After 6 nights on the boat, all involving a few drinks and many involving singing, Michael finally revealed he’d written a song for the trip. Well he’d written a chorus and a bridging part of a song but with spirits already high (thanks Peter), the trip running so well and the drinks flowing freely it became probably the best song ever. We are on a little boat, in the big blue ocean. We are having a good time all day all night. After another full night running south we woke at Western Rocky for our final Myanmar dives. Jumping in at the Eagles Nest for dive one revealed unusual poor visibility for Western Rocky but because of this an absolute abundance of fish. Fish were everywhere and in big schools. Unfortunately I didn’t dive more than a few minutes as a leaking camera forced me to the surface earlier than planned. Damn I was frustrated. Dive two was at Crayfish Cave. There wasn’t much activity in the cave itself but the dive livened up exiting the cave and rounding the western tip of the island. There were plenty of schooling fusiliers whizzing here and there out in the blue. Fimbriated moray eels slithering around the soft corals. The school of big eye snapper in the arch was massive, with more fish than I’ve ever seen there. Simply amazing. We continued along the south side of the rock looking for and finding a few small nudies. We crossed the channel to the smaller pinnacles and shallowed up and completed our final safety stop in Myanmar. Now it was time to head back to Kaw Thaung and then Thailand. With diving activities concluded for the day it was also time to get drunk. There was plenty of time and we got plenty drunk. The trip back to Kaw Thaung felt like a big celebration. Although we’d been unlucky with manta dives we had explored the Mergui Archipelago from top to bottom. We’d gone further north than most known trips to date. We’d gone Off the Chart. We’d had some sensational dives in Myanmar, we’d bonded so well as a group and shared a lot of laughs and good times and we now had a sound track to go with it all. Neil proved his worth utilising the blender, our stash of Hong Thong, an array of fruit juices and ice keeping the celebration going till we reached land. Time to release our boat load of drunken adventurers to run free after 6 days cooped up on the boat. Shore leave. We left our makeshift bar aboard the Deep Andaman Queen and most headed to the more permanent Smile Bar located in the large golden pagoda overlooking the sea front and jetties. It then became a quest to see if we could continuously keep the bar staff delivering ice cold, delicious Myanmar Beer to our table. A few of the group probably did some sightseeing and shopping, but all eventually turned up in Smile Bar. This is simply how it goes, always! Next was Thailand immigration followed by another over night cruise. The captain must have been exhausted by this stage of the expedition but at least we kept him entertained singing directly in front of the bridge. I didn’t confirm this with him but was sure he loved us. Everyone loves a party next door late at night when all you want to do is sleep, right? We were heading to Koh Tachai and alas, more civilisation, sadly on the final leg of our epic adventure. It’s always a bit of a come down waking up moored within an armada of Similan liveaboards. After the solitude of remote Myanmar we’d become well accustomed to having dive sites to ourselves. At least MV Hallelujah was close by and we could raid their supplies for Coke Zero. We always run out of fake sugar drinks on these trips. We restocked and breathed a collective sigh of relief knowing we’d keep our slender, trim shapes till the trip’s conclusion. After dive one the other dive boats departed for Richelieu Rock, keeping to their Similan liveaboard schedules. We had a dive site to ourselves once more. All four dives at Koh Tachai Pinnacle were lovely. The water visibility was great and there was little sign of the notorious strong currents associated with diving this site. There was plenty of fish life too and the coral gardens and sea fans were in great shape. It was so nice in fact that Paul hated the dives here. It was just too perfect, it lacked the edge you only find diving in Myanmar. Had we been on a four day Similan trip it would have been a trip highlight for sure. 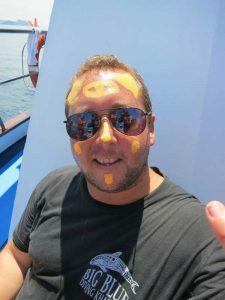 For us, we were heading back to land soon, there were no manta encounters that day and as the armada of other liveaboards started to arrive for the sunset dive we knew our lonely adventure was coming to an end. We delayed the inevitable a little longer with drinking and singing at the front of the boat. 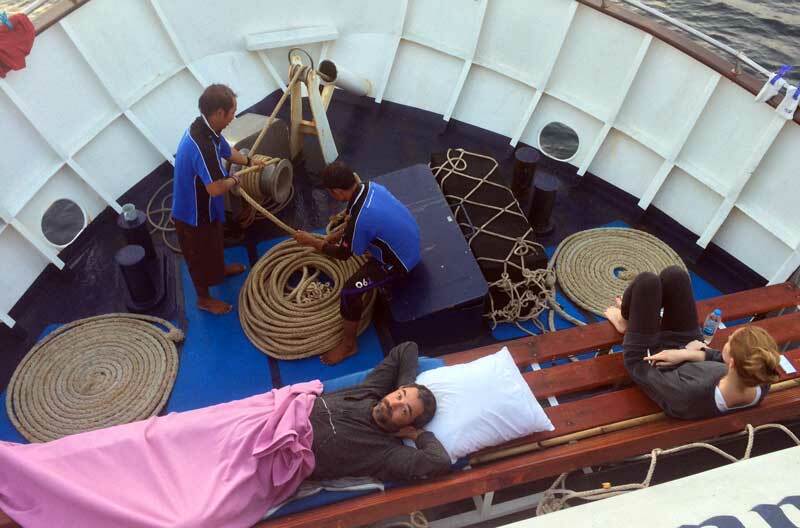 It must have felt like a night off for the captain, we only had a short two hour cruise to Koh Bon. Lucky for him we were as keen as ever to keep him entertained. We had two dives left to do. We were at Koh Bon, Thailand’s premiere manta hotspot. Our last chance for some decent manta encounters, our last stop on our voyage. The Deep Fried Choir woke us up early with our song, We are on a Little Boat, replacing Steve’s usual boat camp reveille. The two dives at Koh Bon unfortunately did not yield any manta encounters. Our good luck had been used up on other aspects of the trip. One year previously Koh Bon had saved our manta expedition with one of my best manta dives ever on the deeper pinnacle. This time round it was the discovery aspect of the trip that had made it work for us. I have done a fair few dives around Thailand and Myanmar since I first signed up for my dive master course in December 2004. I’ve run dive boats, worked dive boats, booked guests on boats and chartered boats over the years since then. During this time I’ve two favourite types of trips that have been seasonal highlights for me since 2009. Firstly there were the 9 day Burma Discovery Expeditions I ran on MV Similan Jazz with Siam Adventure Divers. The final one in 2011 was the first time I dived with Dr Andrea Marshall which introduced me to manta conservation and research. Since then I have been involved with yearly Ray of Hope Expeditions with the Marine Megafauna Foundation. These trips keep my passion for diving alive, they provide purpose to what I do here in Thailand. Without these expeditions and my involvement with the MMF studying manta rays I wonder whether I would still be so active in the local dive industry. Probably, but who knows. In planning the 2017 Manta Discovery Expedition I wanted to combine the core aspects of our old Burma Discovery trips and the more recent manta research expeditions. I wanted the thrill of further exploration in Myanmar and what better way to do this than choosing unknown areas where we might encounter manta rays. Having two purposes to the trip ensured a better chance of success. In this case we were unlucky with manta encounters but we did discover West Canister Island. We had amazing dives there and there were many indications that we found a decent manta aggregation site. I have quite a hazy memory when it comes to past liveaboards trips and I realise I probably say every year after an expedition that that was the best trip ever, but in this case I really have to borrow the intention and meaningfulness in the way Katja says it. That really was the best trip ever. Heading Off the Chart was the moment I knew we had found a winning formula. The moment was warmly and enthusiastically celebrated. As a team we’d done it. So a huge thank you goes to all the guests for your participation and upbeat spirit at all times of the trip. Thanks to Niko and Chris, my partners in crime at Diversion and thanks to Rachel for your ongoing help. Cheers Neil and Christian for your contributions. Special thanks to Steve for backing our somewhat ambitious route and the amazing work your crew did making it run so smoothly, Liana and Chiko too. Last but by no means least thank you Anna, its participating with you and the MMF that drives me to do all this. So what’s next? More Off the Chart Expeditions and much, much more of the above. Next is Off the Chart Raja Ampat in December 2017, who’s in?